Choosing between two excellent drones is tough. I would know, I’m always stuck in endless sessions of racking my brain trying to make a good decision – you’ll find me with my mouth hanging open during meals, while driving, in the shower, on the toilet … trying to answer life’s most burning question (at least at that point in time). Which should I get if I had a choice between the DJI Spark vs Mavic drones? So before you keep thinking about it, let’s put these two DJI drones in a head-to-head comparison laying out the full DJI Mavic vs Spark specs and see what the differences between the two are. At www.dronesbuy.net we’ve already had a fairly detailed look at both of these drones, so if you’re looking for an individual review of the DJI Spark or the Mavic, head over to these two links and immerse yourself in plenty of details. What is the DJI Spark? What is the DJI Mavic? The Mavic was a revolution in drone tech, in the already revolutionary world of drones. 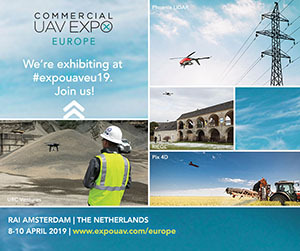 While drones have been soaring in popularity over the last few years, thanks in part to such drones as the DJI Phantom Pro series, the Mavic sparked a new kind of revolution. But why did the Mavic spark such a boom in drones? Good drones with high-tech specifications, again such as the Phantom pro are bulky. They’re not easy to carry around. They need their own carry-bag, which is typically also quite bulky. And when you’re a videographer going to an event or a shoot, the last thing you need is to lug even more stuff around. On the other hand, small portable drones, had very low specifications. Typically, no high-definition photos or video, no 4K video, short flight time and battery life. So in reality, you had no choice. If you wanted to get a good video, you had to buy a high-specifications but bulky drone. Enter the DJI Mavic Pro. The DJI Mavic changed all this. It is a high-specification drone, which is actually very small + very portable. So when the DJI Mavic Pro was released, you no longer had to compromise. Great video specifications, good flight time + battery life, excellent software features. Such stuff as obstacle avoidance, follow-me (Active Track) and other essential features are default in the Mavic. For anybody who does videography or photography for a living, these are much-have features. At the same time, the drone is small. It also folds up, such that it becomes even smaller. This is essential for those who need to carry their drone around. 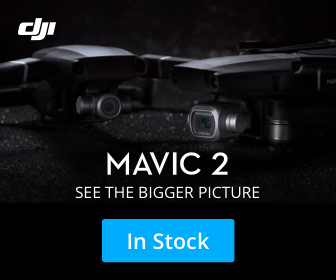 Just to put things into an even better perspective, the picture coming up next can give you a much better idea of the actual size of the Mavic. Truth be told, when you see it live for the very first time, you’ll be amazed at how small it actually is. So yeah – the DJI Mavic brought the best of both worlds. And that ladies and gentlemen, is why it is selling like hot cakes. Even reviews of the Mavic have been incredible. Size does matter. We’ve just seen why above. While in many cases smaller is not necessarily better (!) … when it comes to technology and tech gadgets, we all know that size is typically always better. It’s mostly a portability issue. When it comes to consumer technology (something which the DJI Spark hopes to become), small is key. What DJI did with the Spark, they took everything there is in the DJI Mavic and shrunk it to less than half its size! When it comes to DJI Mavic vs Spark size, we feel that the Spark is a baby Mavic as the above image can clearly show. Again, to put things in an even better perspective, it’s best to actually show you something to compare the size of the DJI Spark to. You can see below the size difference of the DJI Spark vs two common phones. You might remember that the iPhone 5S was tiny compared to today’s iPhones. We do believe that the idea behind the DJI Spark vs Mavic in terms of size is this: DJI want to provide nearly the same feature set of the Mavic in a much smaller package. Nearly every feature which there is in the DJI Spark, is found in the Mavic, albeit on a smaller scale sometimes. Read on to see exactly what the differences are. This would take the drone, from the realm of the professional photographer/videographer to the amateur video shooters and the mass population. Essentially, DJI wants to do to the drone, what Apple did to the mobile phone more than 10 years ago. They want to put a drone in everybody’s pocket. And the only way to do that is to create a drone so small, that you’ll barely notice you’ll be carrying it around. In essence, this would be the real drone revolution, when everyone will own a drone. So let’s start with the actual comparison of the DJI Spark vs Mavic Pro. Without a shadow of doubt, the Fly More package is a no-brainer, for $200, you get a much better deal, because buying each of all these items individually (which you are going to probably need anyway) will cost you much more. THe DJI Mavic on the other hand is a bit pricier, starting off at $999 – which is double the basic price of the DJI Spark or an additional 500 bucks. The Fly More bundle, which consists of roughly the same stuff as the accessories for the Spark will set you back another $300, i.e. $1299. Again, a fair deal we feel. So if you’re making a decision based on cost alone, the DJI Spark is the winner. But we never make a decision based on price alone, do we? Read on to see further differences between the DJI Spark vs DJI Mavic Pro. Most of us making a decision on whether to buy a drone are going to give huge importance to the quality of the video footage and photos we can capture. After all, it’s one of the primary reasons why we get a drone right? And there are differences in the camera specifications of the Mavic vs Spark drone. If you want a head-to-head of the camera specs of the Spark vs the Mavic, we’ve listed all the essential features below, so you can compare them line by line. The Mavic’s camera is just slightly more specced, however the Spark has some new software features given that it is actually a newer model. Given that the drone weighs only 300 grams, the UltraSmooth technology is a much-needed feature in the real-world, where such movements due to gusts of wind are smoothed out, with the result being a crisp, smooth video. As you can probably pick up from the above table, the Mavic is the drone with the better video capabilities, whilst the new software features give the Spark a potential edge when it comes to photos, once again making the Spark a perfect selfie-drone, while keeping the Mavic in the realm of the (semi-)professional videographer. The Mavic shines when it comes to video. Crucially, the Mavic supports 4K video shooting, giving a sharper end-result with more detail. Essentially, if you’re looking for the highest video quality, you can take a decisions right here – the Mavic is the way to go. Given that the Mavic has a 3-axis gimbal as opposed to the 2-axis gimbal on the Spark, the Mavic has the better stabilization end-result. This is particularly important when you are flying in windy conditions. In the case of low-wind conditions, the 2-axis gimbal of the Spark should be sufficient. But if there’s a strong breeze or gusty winds, the occasional back and forth yawing which causes the video to shake from left to right (with the Spark). The third axis of the 3-axis gimbal of the Mavic gets rid this left to right shaking. The Mavic Pro is also capable of shooting 1080p 60FPS slow-motion videos and even 720p, 120FPS mode, however the quality is a bit on the low wide in the latter mode. While the Spark is a smaller drone than the Mavic, so it has less weight to lift, the battery pack is also smaller. ALL IN all, the Spark has a spec-sheet flight-time of 16 minutes. In real-world flying time, we started getting warnings to land the drone at about 10 to 12 minutes, but you would probably be able to push it a bit further in emergencies, of course, at your own risk! The DJI Mavic has a spec-sheet maximum flight time of 27 minutes, but you’re more likely to get about 21 to 23 minutes of flight-time, until you get the 15% battery warning, particularly depending on the wind and weather conditions of where you are flying. Of course, if you want to double your flight-time, for both the DJI Spark or the Mavic, you should get an extra battery. This is standard with the Fly More bundle. Besides the flight time, the speed of both drones varies. The Mavic of course, having larger propellers and bigger motors than the Spark is able to go faster. The Mavic can fly at 40MPH in Sport mode, whereas the Spark can fly at up to 31MPH, without any wind. If you’re looking for a feature which is unique to the DJI Spark, it’s the ability to fly autonomously. Yes, that means you don’t need either a controller or a phone to fly the DJI Spark. This drone actually features full gesture-controlled flight. It can take-off and land from the palm of your hand, it recognizes your face and flies in the directions which you point it towards. And if you want the drone to take a selfie, there’s a gesture for that too. Although the Mavic has limited gesture-control features, such as the ability to take a selfie, it’s not as autonomous as the DJI Spark. 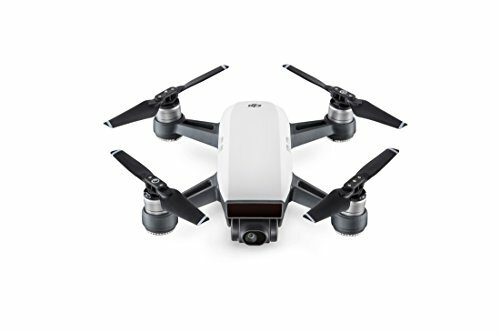 Another unique feature of the this drone, is the DJI Spark docking station or charging dock, which is for all intents and purposes a charging station. Although this has been seen in promotional material, it still doesn’t seem to be available for sale. Portability: the Spark or the Mavic? With the DJI Spark being practically half the size of the Mavic, you’d expect it to take the edge in terms of portability. Yet, this is not the case thanks to the unique foldable design of the Mavic Pro. Since the Mavic, when folded becomes just about the size of a can of Coke, it is much easier to stuff into whatever bag you’re carrying. The Spark, even with such a small size is not foldable. That means that its arms and propellers need to be nestled carefully in a carry-bag which is custom-made for the Spark, if you want to ensure you don’t cause any damage to the drone while traveling. In terms of range and controller, the Mavic has the edge over the Spark. The Mavic’s controller had Ocusync, DJI’s communication technology which pushes the Mavic to a maximum range of 4.3 miles as opposed to the 1.2 miles with HD Wi-Fi on the Spark. If you’re also planning on purchasing the DJI Goggles, the Mavic Pro is able to communicate with them wirelessly, for a longer range and with such options as 1080p streaming. The controller on the Mavic also has an LCD screen with important flight information – giving you access to details such as current speed, altitude, distance from home, battery level and more. The DJI Mavic Controller with built-in LCD screen besides phone integration. On the other hand, the DJI Spark’s controller is missing the LCD screen, so this information would only be available if you’ve got a phone attached to the screen with the DJI Go app installed. Both the DJI Spark and the Mavic have built-in obstacle avoidance, a critical feature if you’re flying the drone out of your line-of-sight (where it is legal!). The way OA is done on the Spark is via a custom infrared sensor, which is only capable of detecting obstacles in low resolution. On the other hand, the Mavic uses two RGB sensors that have much better capabilities at detecting obstacles since they are able to generate better obstacle maps. This allows the Mavic to be able to detect and avoid smaller objects from a further distance than the Spark. Crucially, the Spark can only detect obstacles if it’s going at up to 7MPH, whilst the Mavic can detect obstacles going at a speed of up to 22MPH, giving the Mavic a significant advantage in this regard. On the other hand, the Mavic is a more refined drone. It has mostly better features throughout. In reality, if you can afford the Mavic, I’d go for that one. If you’re not sure, just see whether there is a must-have feature or specification and then make your choice. If you need 4K video, the Mavic is your drone. Ultimately, both of these drones, the DJI Spark and the Mavic Pro are fantastic drones, you won’t go wrong with either of them!